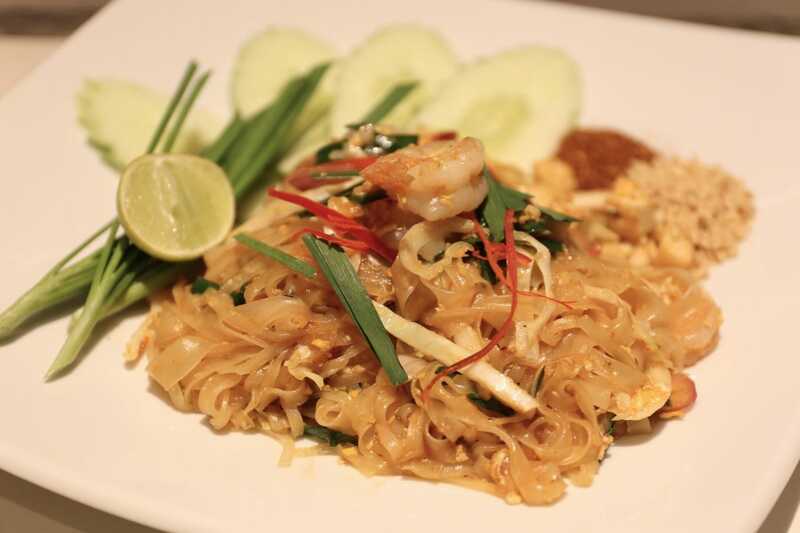 Thai food is famous for its aromatic and spicy qualities. Chili peppers were first imported to Thailand from the New World in the 16th century by European traders and were adopted into Thai cuisine with great enthusiasm. Although influences from China and India can be noticed in stir-fries and curries, Thai creativity has yielded a wide range of dishes unique to the country. All Thai dishes strike a balance between the four flavours – sweet, sour, salty and hot. While Thai cuisine is liberal with its use of chilies, it also feature a variety of subtly flavoured dishes that make use of aromatic herbs and spices such as galangal, lemongrass, kaffir lime leaves, basil and cilantro to enhance aroma and taste. Pastes using these ingredients are pounded in a mortar to ensure the freshest flavour. However, the real key to Thai cuisine is fish sauce, which adds its typical piquancy to most dishes. Mixed with chilies, garlic, and lemon it becomes the most popular condiment, prik nam pla. 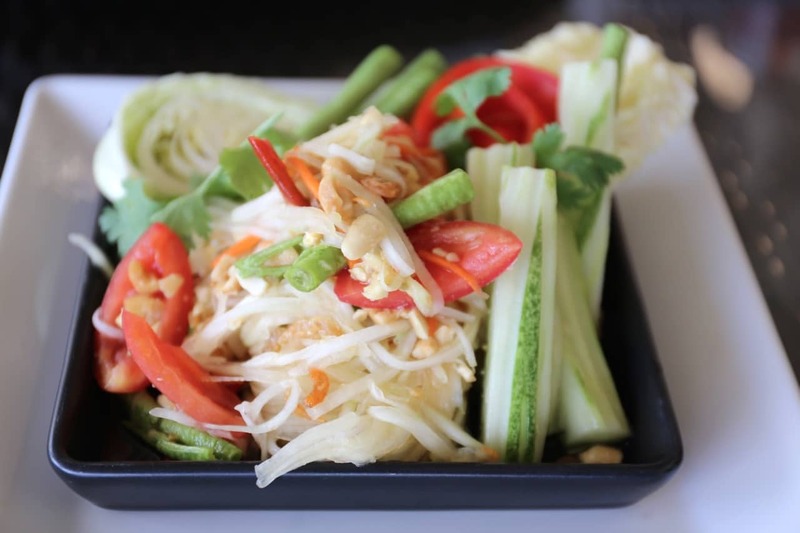 Som Tam is a refreshing and crunchy cold salad featuring shredded unripe papaya, cucumber, carrot, green beans and tomato tossed in lime juice, chili, fish sauce and dried shrimp. 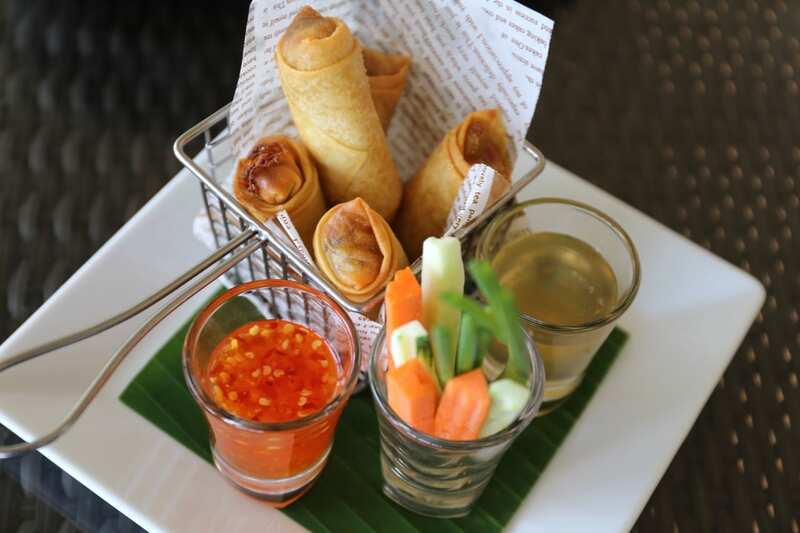 Spring Rolls are Thailand’s ubiquitous street-side snack. Wrappers are stuffed with shredded vegetables, tofu and herbs then deep fried. Enjoy dipped in sweet meets spicy Thai chili sauce. 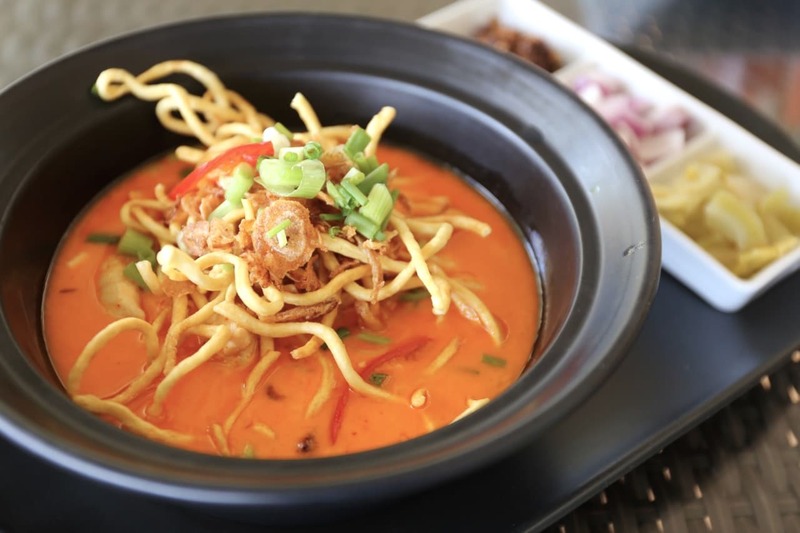 Khao Soi is a Burmese-influenced dish that means “cut rice” in Thai. The soup-like dish is made with a mix of deep-fried crispy egg noodles and boiled egg noodles, pickled mustard greens, shallots, lime, ground chillies fried in oil, and meat in a curry-like sauce containing coconut milk. 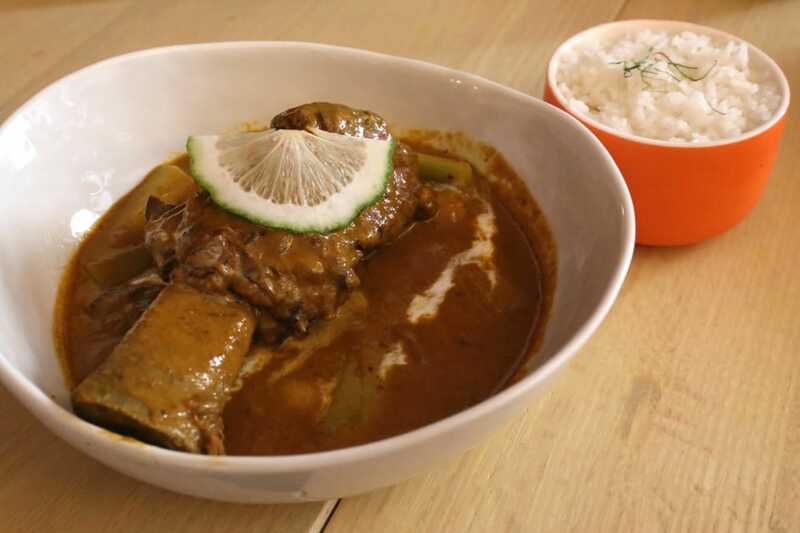 The curry is somewhat similar to that of yellow or massaman curry but of a thinner consistency. 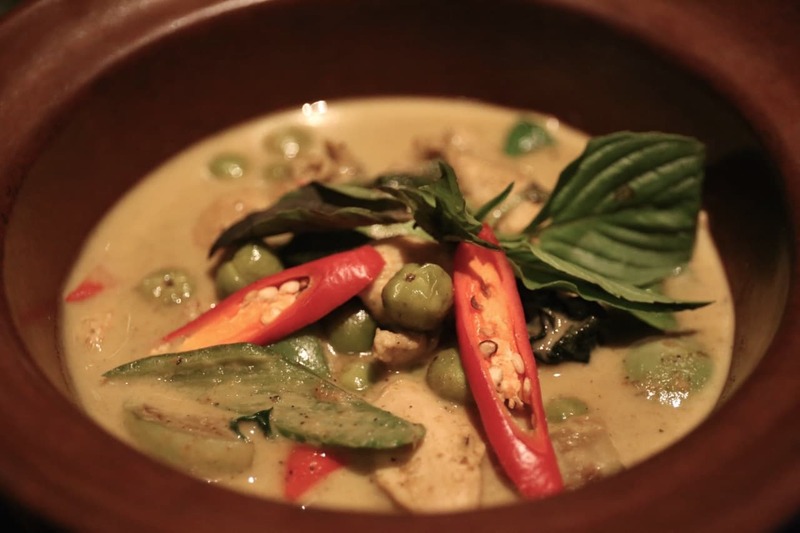 Green Curry is Thailand’s most popular curry, a classic dish typically served with chicken, tart eggplant (a local variety slightly larger than a green pea), creamy coconut milk, spicy peppers, fish sauce, palm sugar, Thai basil and green curry paste. 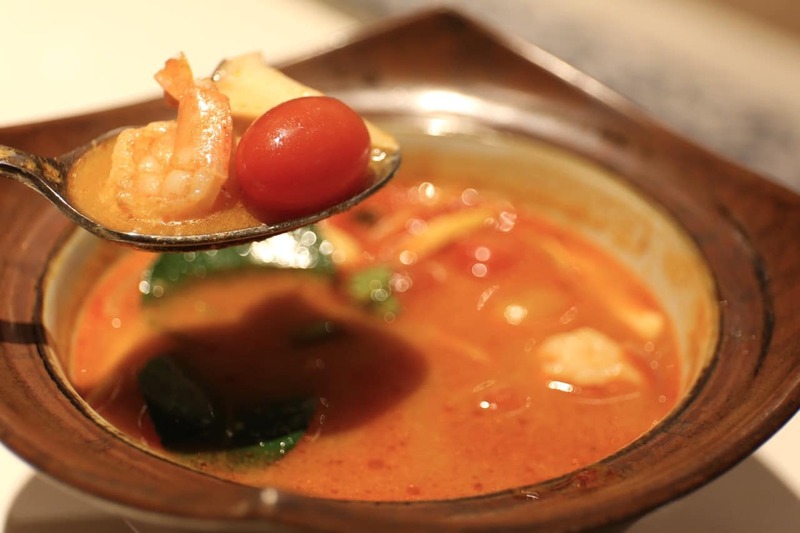 Tom Yum is a popular hot and sour Thai soup featuring plump shrimp. The words “tom yum” are derived from two Thai words. Tom refers to the boiling process, while yam refers to a Thai spicy and sour salad. The basic broth is made of stock and fresh ingredients such as lemongrass, kaffir lime leaves, galangal, tomatoes, lime juice, fish sauce, and crushed chili peppers. Pad Thai is a stir-fried rice noodle dish commonly served as a street food and at casual local eateries in Thailand. It is made with soaked dried rice noodles, which are stir-fried with eggs and chopped firm tofu, and flavoured with tamarind pulp, fish sauce, dried shrimp, garlic, shallots, red chili pepper and palm sugar, and served with lime wedges and chopped roast peanuts. It may also contain other ingredients like bean sprouts, garlic chives, coriander leaves, pickled radishes, turnips, raw banana flowers, chicken or shrimp. Massaman Curry is a rich, relatively mild Thai curry. Massaman is not a native Thai word. It is generally thought to refer to Muslims, with early writers from the mid-19th century calling the dish “Mussulman curry”; Mussulman being an archaic form of the word Muslim. The flavours of the massaman curry paste come from spices that are not frequently used in other Thai curries. Cardamom, cinnamon, cloves, star anise, cumin, bay leaves, nutmeg and mace would, in the 17th century, were brought to Thailand from the Malay Archipelago and South Asia by foreigners, a trade originally dominated by Muslim traders from the Middle East and Indian subcontinent. These spices are combined with dried chili peppers, coriander seeds, lemongrass, galangal, white pepper, shrimp paste, shallots and garlic. This paste is first fried with coconut cream, and then meat, potatoes, onions, fish sauce, tamarind paste, sugar, coconut milk and peanuts are added. 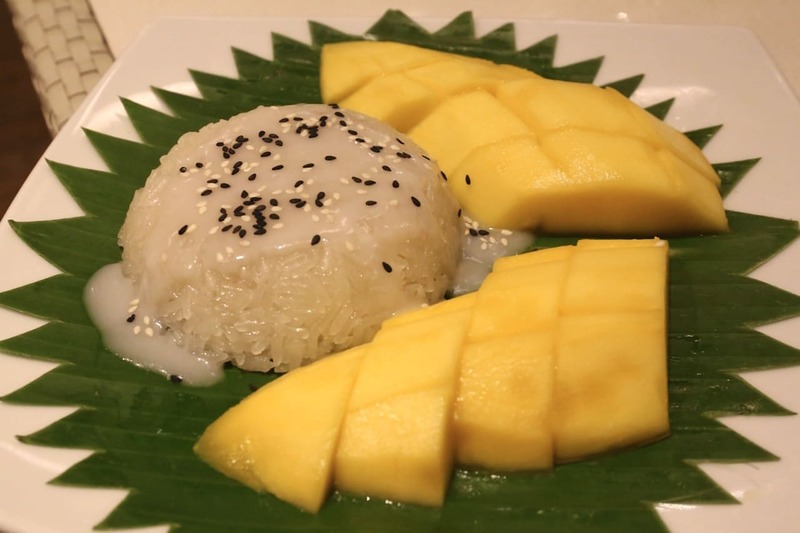 Mango Sticky Rice is a Thai dessert made with glutinous rice, fresh mango and coconut milk. Best enjoyed while basking on the beach. Singha Beer is Thailand’s go to brew, adorned with a powerful mythological lion, found in ancient Indian, Hindu and Thai stories. 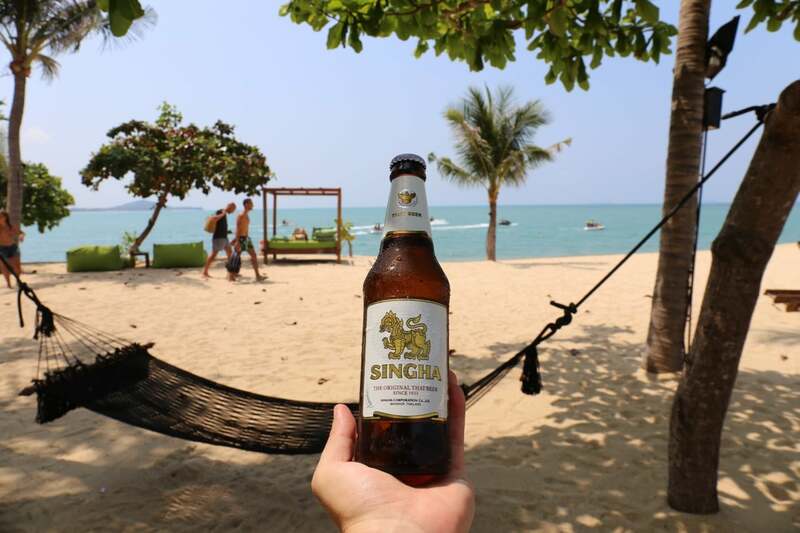 The ice cold lager is best enjoyed as a thirst quencher while swinging on a hammock at the beach or at dinner as it pairs perfectly with spicy Thai dishes. Larb Gai is a cold chicken salad popular in Thailand. The recipe has been passed down from Laos chefs who popularized the dish. 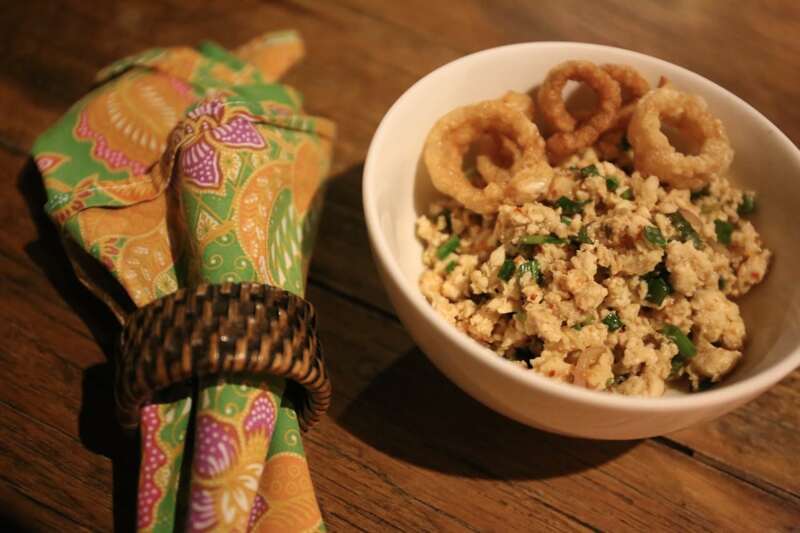 The spicy salad is often made with ground chicken, fish sauce, lime, roasted ground rice, chilies and fresh herbs.